Wow, guys. Long time, eh? Man, I logged in and see that last active: Wed Feb 12, 2014. You guys probably forgot allll about me. Hate distracting FaceCams on Videos? Annoyed at having something bouncing in the corner while you are trying to watch something else? Well now you can do something about it! Just run 'FaceCamCover.exe' and apply directly to FaceCams by clicking and dragging the cover with your mouse. It's that easy! Tested on WinXP and Win10. Both are better then my docs by far. Any issues, please let me know, and I'll get to them as soon as I can. So that should be it, unless someone has an issue with it (that I can fix ). ...and this time, I mean it! Fixed FaceCam Cover not saving on PC shutdown. So now it triggers twice, but will only write to disk once if there are size&position changes detected. Note: This was not my fault, imo, it's a bug in either Lazarus or the FPC. 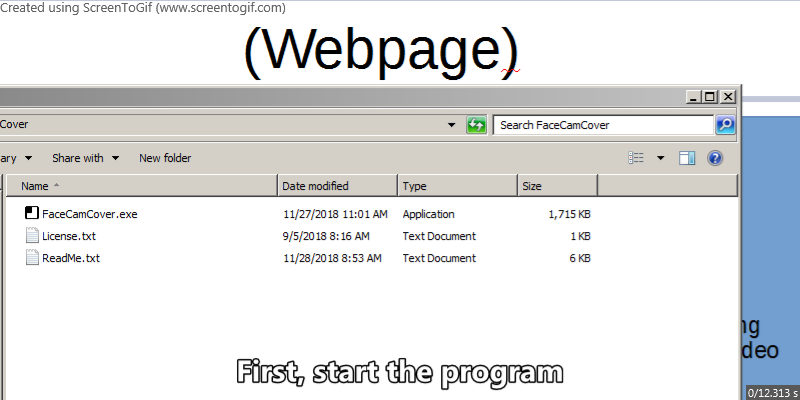 Made it so if the 'FaceCamCover_Options.ini' exist, 'Create INI' will be 'Reload INI' instead, which loads the INI file the same way as running FaceCamCover.exe. (*If Enabled with '1', when clicking 'Reload INI' this will LOAD the Saved Top, Left, Height, and Width in the INI, not Save them. Due to how the 'ALT-ESC' hook is implemented in the program, a FaceCamCover restart is required to change the option from Enabled or Disabled. Made changes to the way the program closes, it should now save the 'Save_Size_and_Position' settings when the Computer is turned off and FaceCam Cover is running. Also made format changes to the ini file, this will NOT affect old ini files, they will work just fine. It's just a "fix" for the blank lines disappearing. ...And by 'fix' I mean I changed the blank lines to 'commented out' lines. Now FaceCam Cover only saves changes to the ini file when there are changes to be saved. Meaning it no longer writes to the ini if nothing changed. Not necessary, but everything helps with USB-Sticks and SSD drives. Added the ini option to disable the saving of 'Size and Position' but still load the last saved 'Size and Position'. You MUST set 'Save_Size_and_Position=0' to Disable the Saving of 'Size and Position'. In other words, you can use the 'Load_Size_and_Position=1' with 'Save_Size_and_Position=0' option to start FaceCam Cover, then change its size and close the program without worrying about it saving the new size. To use it, just add 'Load_Size_and_Position=1' to the 'FaceCamCover_Options.ini' file. Added URL button for Pascal Colors. Fixed a minor bug I found when you have the 'About' box open and Hide or Close the program. Random small bits in the ReadMe. No bugs/issues reported, so not much really changed other then text. Changed the named of the .ini file from 'Options.ini' to 'FaceCamCover_Options.ini'. Also added URL buttons in the About section. Edit: File deleted from post so all the downloads I don't get wont break the website. Last edited by Firewrath on Wed Apr 03, 2019 2:48 pm, edited 11 times in total. "It's not that I'm Evil, just that I'm unwillingly Good." It might take me a while to reply to any post or comments, I only have internet access once a week. So if I don't reply or miss a question, this is why. Firewrath wrote: ↑ Wow, guys. Long time, eh? Talk of the devil... Welcome back. Added to MajorGeeks today, please email us at mgnews @ when you update? We linked to this page as the homepage for the program. Great addition, thanks. Can you post a screenshot? Soon I hope to get a new job (Nothing programming based if anyone is curious) and hopefully Cell based internet then. Its not much, but I tried to show things a little differently. Well really, I didn't think this would get "out" yet, but sure. i'll send an email or something when I do my release version. Which will probably be next week since I havn't heard of any issues. I'll probably move the 'Homepage' to a TPFC page once it gets added, but that'll come later. but it's good enough for now. Fixed issue where you couldn't move the Cover by clicking on the clock and dragging. Changed the clock to be more responsive when pressing CTRL. The blank lines in the INI file disappear on close when 'Save Size and Position' is enabled. This is not a problem, the program still works correctly, but out of curiosity I'll look into it. Last edited by Firewrath on Wed Sep 19, 2018 10:01 am, edited 1 time in total. Alright. I guess it's done. Havn't heard of any problems with it, so Here is the Final Release version of FaceCam Cover. I was REALLY hoping I could find some way to track the downloads, but doesn't look like that is going to happen. Ahwell. So if it doesn't happen I'll get to it. Made the Mouse Cursor autohide after five seconds. FaceCam Cover is a program made to cover up annoying and/or distracting 'Face Cams' on internet videos. Though it can be used to put a 'cover' over anything on your screen. So if its up to par, Vote! Thanks for posting but could you bring the post a little closer to the format used by other entries? For example the other entries don't list hash values and we don't start entries with questions like "having problems with X?" Also the hashes where there since it was just a forum release and doesnt really have a home page and such. For color codes, consult this list of Pascal Colors and TColor hashes. For example, Red is: clRed or $0000FF. I modified the entry further, listing the config instructions in this forum. Obviously if you need to modify those in the future, just create/edit a new post and I'll point to that. Minor changes but still stuff I wanted to add. ...ohyeah, a change I made thats not in the ReadMe, FaceCam Cover only saves changes to the ini file when there are changes to be saved. ...unless someone finds a bug that needs fixing. I finally tested this out and put together a quick demo. Thanks Firewrath.